Do you have to have 1000 meters plus throw? You already picked two pretty damn good ones for that. You looking for any kind of usable spill from that throw or just a dedicated thrower? Looks like being my next. the one with combination emitters preferably that one from Texas. Want’s being a different thing altogether. 17 now with another 4 in post at present. Already have BLF Q8. But it is not a real thrower light, rather general use powerhouse. Plus, I never got over its rather poor “aesthetics” and no proper lanyard hole. Im looking for long throw but with usable spill, thats why I dont want a dedicated thrower, like the ones with huge reflector and single XHP35 LED. Apart from already mentioned Acebeam K65 and Thrunite TN40S I would throw in JetBeam T6 and perhaps the TN series from Nitecore. MT09R Haikelite is interesting suggestion, probably in the 3x XHP35 configuration. Keep your suggestions going, thanks! He said thrunite in the video, reviewing what they had for sale then, and the shape of the head, i’d say maybe the TN40? It was a TN40, listed in the information under the video, if you click on additional. That’s a TN40 in the video, so that’s an option for you. I could tell by the shape of its head, and the petal pattern of the spill in the video. If you want a single emitter thrower, the Acebeam K65 with an XHP70.2 dedomed will have similar performance to the TN40, but with slightly more lumens and lightly less throw. 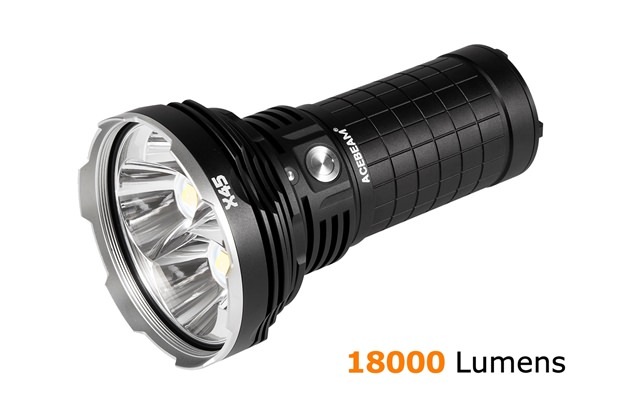 Skylumen also has a version of the Thrunite TN42 where he puts a Luminus CFT90 LED in it to get 5000 lumen and 1m kcd. Indeed it is TN40 in the video, and the beamshots look very impresive. I am just wondering if there are other interesting multi emitter options for example from Nitecore or perhaps a single XHP70.2 apart from K65. Some cheaper alternatives may be the Black Shadow Terminator, Solarforce SP-03, and then the Nitecore TM16 also is nice but pricier. I put 3 SST-40’s in my SP-03 (and some tricks in the driver department) and it’s making close to 8000 lumens with a great spot and spill. Similarly the Terminator does well with more modern emitters like the XP-L HI or a set of de-domed XM-L2 U4’s. The nice thing is the size of the individual reflectors, sort of a revision of the BTU Shocker, each reflector is almost C8 sized. It also has a handle for ease of carry and uses 4 parallel 18650’s. The handle can be removed and the light used in standard format, doesn’t upset the e-switch use or it’s water ingress protection. I’m actually using ToyKeeper’s Anduril in mine so it has lightning mode and candlelight, as well as useful strobes that can be set as to speed as well as a beacon that is also configurable. Thermal protection too can be set as well as the initial ambient reading. Really makes the SP-03 a modern useful flashlight that suits a wide set of needs. Edit: Should also say that the SP-03 is more compact than it may seem, shorter than an L2 with a head diameter only slightly larger than a Courui D01 Fathead. 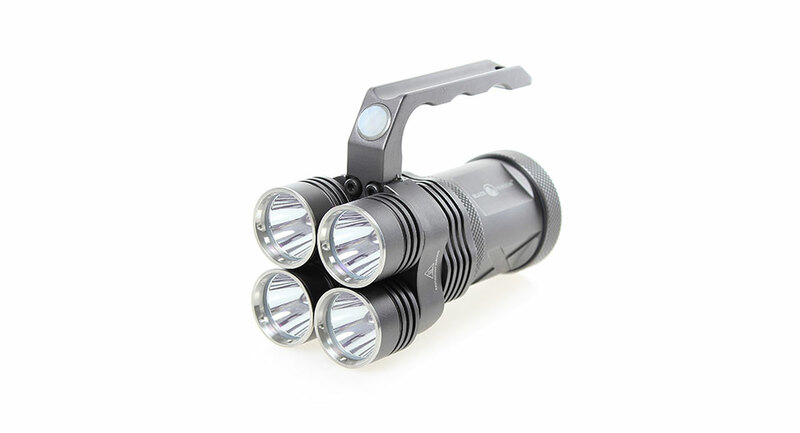 The Black Shadow Terminator makes about 3500 lumens from 4 XM-L2 emitters, 4 18650 cells in parallel and sells for around $100 also at FastTech. This one has the switch in the handle though, so removal of the handle isn’t as desirable. You’re always going to get a green tint from a dedomed Cree led. No matter the manufacturer, you will be subject to the tint lottery of Cree LEDs if they use a Cree LED. It comes down more to the specific LED in the light than the manufacturer of the light. The XHP35 HI for the most part though seems to have rather decent tints in the 4500k range. I haven’t read too many stories of grossly green 35 HIs compared to 70.2s or XPLs. I’m not sure who sells a multi emitter NW XHP35 HI light stock, but I imagine it will be expensive. You can get someone to mod those emitters into a host of your choice as well, but that too will be expensive. Which of course isn’t exactly the truth of the matter. Do this a few hundred times and you’ll see, there are good tints from clean de-domes. It’s not easy, not reliably accurate to pick the right emitter, but it does happen. Which is why MaxToch de-domed for stock lights in the Shooter 2X. And didn’t the Olight M2X-UT also come with a factory de-domed emitter? It happens, it’s just not easy sometimes. Wish I had a dollar for every Cree emitter I’ve used, or for every one I’ve removed the dome from…. What does my 21 posts have to do with anything? This isn’t the main flashlight forum I frequent. That just comes off as rude and insulting. I’m also a tint snob by nature, so I’m very sensitive to green bias in LEDs. Even the best cherry picked dedome jobs I’ve seen or used look slightly green— whether they’re from a manufacturer or from an individual modder. Budget aside and apart from the “tint lotery” which one would YOU guys go for? Acebeam K65 or TN40S? Why and which tint would you choose? Well, you’re stating unequivocably that if it’s a Cree it’s a gamble and that’s just not so. I’ve built hundreds of de-domed lights, what you’re saying is not true and it’s misleading to everyone else that is new here and taking what your’e saying like it’s gospel. With 21 posts here you have to admit, there’s no credibility for experience. Otherwise known as noob, whether you are or not is completely unknown but you are HERE. So you can come in and call my years of experience a lie, and that’s not rude and insulting? Geesh. Noobs. When did I ever specifically call your years of experience a lie? Get off your confrontational attitude. You show me a dedomed light with an amazing tint and I’ll shut myself up. Compare it to a stock XHP35 HI or Nichia light. In fact I would gladly buy one from you if you could produce a dedomed 70.2 that wasn’t greenish. Until then I will continue to tell others what I believe to be true with all dedome jobs I’ve come across, as I feel it’s safer to them to let them know a dedome will result in slight shift to green. With regarding tint, one of the benefits of dedoming is that you will get less tint shift within the beam, since flat emitters interact with reflectors differently than domed ones. In general I consider this to be more pleasing than something that’s very greenish in the corona and purplish in the spill. I also feel you should go with the TN40S, since it’s pretty much what you wanted based on the video you linked. I’ve not used the K65 myself, but from what I’ve seen of it makes it look rather yellow-greenish. As for the attitude, sorry about that, indeed my bad. Not everyone is a tint snob, a lot of people like a blue white beam and some even like a green hue. We have literally thousands of new people here, stating something as an opinion and making it sound unequivocable is misleading to the many new people. I like the tn40s or the Jetbeam t6. The spo3 is nice when modded. I kinda regret selling that light now after hearing what dale did to his. Those sst40 made a huge difference! Mine was only doin close to 4000 and it was modified. I also like the convoy l6 with smo reflector modded with new driver and 70.2. Yes, the high output thrower: Convoy L6 is what I would buy eventually for myself, so I would recommend that. Between those two, i will go with the tn40s..
1.Thrunite offer discount price. I seem acebeam increase their price lately.. why?? 2. Use high bin led.. (. My tn36ut use high bin led). 4. Thrunite stock driver are reliable.. I have both the MT09R XHP70.2 and XHP35 versions modded by TA. Both use 80CRI emitters. The 70.2 version uses 80CRI 4000k emitters that I can actually see more details and textures walking in the woods compared to my 90CRI 5000k MF01 219C. If I were to choose between the 70.2 and 35 version, I would definitely go with the 70.2 because it is just so freaking bright measured at 23k OTF lumens. Because of the shear lumens, the throw is also really good. The 35 version I use mixed 4000k and 4500k 80CRI emitters and it is good useful thrower on its own but compared side-by-side with the 70.2 version, the 70.2 just blows it away. 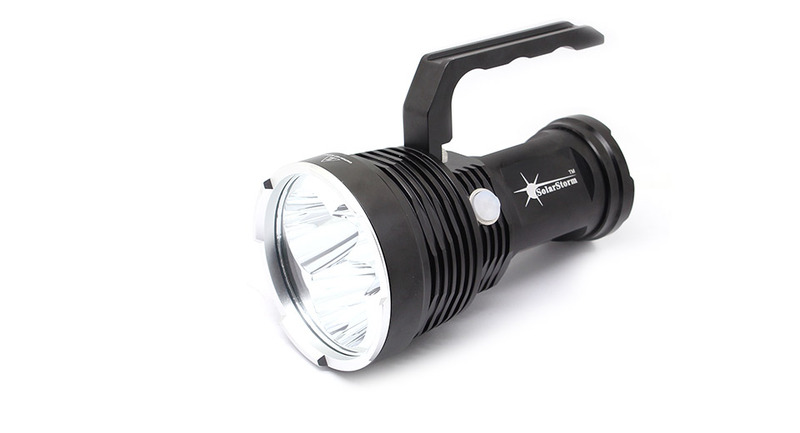 You can also consider buying a MT07S and having it shipped to TA to mod it with a dedomed 70.2 emitter with CRI and tint of your choice and get 9k lumens with great throw and should still be cheaper than the Acebeam K65. Thanks for all your interesting suggestions, but as I am from Europe, shipping and modding anything by TA is not a question As for suggested MF02, I am more after high output than a pencil beam thrower, and L6 id dont want for not being throwy enough. UI has been completely changed. In terms of value, the Convoy L6 someone recommended is a good choice. The Convoy L2 is a smaller good choice, but I think you would need to mod it to an XHP50 or 50.2 to get closer to your desired beam profile. Another less-expensive option is any of the Jax X1 series, they come with either a smooth reflector (more throw, more laser-like beam) or a orange peel reflector. I own the orange peal reflector version and dedomed the stock XHP50, and I’mvery pleased with the beam profile. Is a nice blend of throw and flood, but its not by any means a 1000 yard thrower, just a good option at a reasonable price. Also the Jax Z1 series I hear is a good choice, but don’t own one. That is the the aspheric “zoomie” version, so that might give you the option between flood and throw whenever necessary.